The snake was very heavy. Note how my snake pole is bending. Also note that I'm keeping my distance. This is North America's deadliest snake. It's also an incredibly fast striker, whose strike has been clocked at over 175 miles per hour. Indoors after it got dark. These photoshoots were not easy, as the snake was aggressively striking at any opportunity. This is not a snake to be treated casually! You may notice me sweating a bit. And back in the big cardboard box. I did not kill this magnificent specimen (nor did I measure it). Eastern Diamondback rattlesnake - The eastern diamondback rattlesnake lives in throughout the Eastern part of North America. 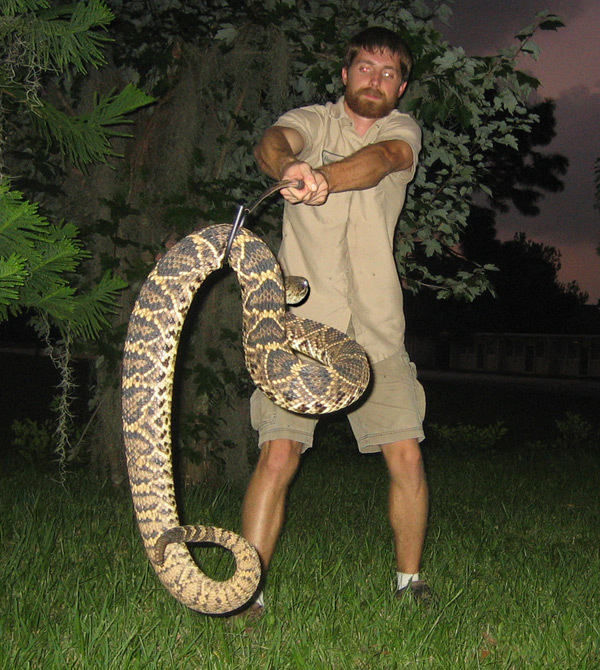 It is the largest of the pit vipers, growing to be eight feet long and weighing up to ten pounds. 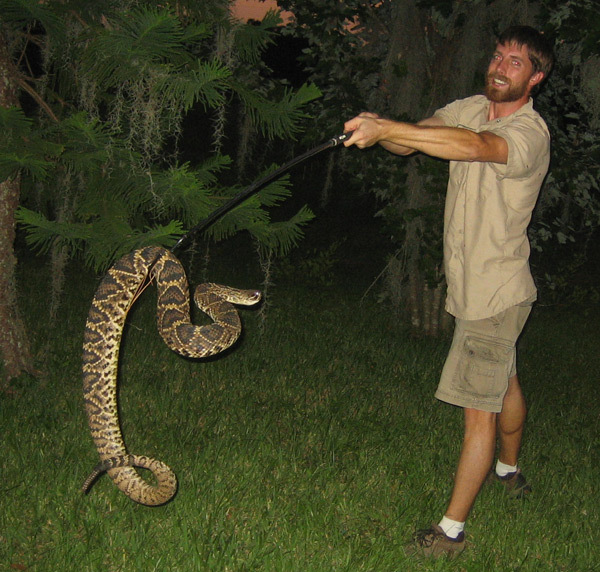 A diamondback is easy to identify by its characteristic black diamond color pattern and the rattle on its tail. The rattle itself is composed of dead skin, and every time the snake sheds a new piece is added to the rattle. These segments break and fall off, so it is not a reliable gauge of the animal�s age. Despite common depictions in movies, the rattlesnake will shake its tail if it feels threatened, hoping that the enemy passes it by. A rattle does not mean imminent doom. If you accidently approach a rattle snake, the best thing you can do is slowly back away. When you are far enough away, the snake will stop rattling its tail. This snake will live in the burrows of other animals. It is also a proficient swimmer and climber. Because of the demand for rattlesnake meat, the population of the species has significantly decreased over the last decade. What do you do if you find a rattlesnake in your house - There are a few options if you find a rattlesnake in your house. First, if possible, leave a door to the outside open and see if the snake will leave on its own. This is only practical if the room the snake is in has a door to the outside or is connected to a room with such a door. You do not want the snake moving freely around the home. This will just give the snake a chance to hide under an appliance or piece of furniture. 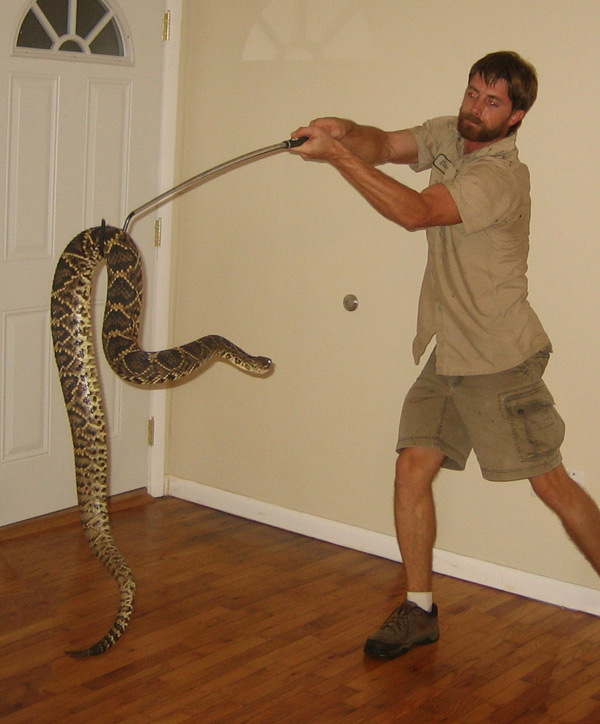 The other option you have is to close the snake into a single area and call a professional. There is no reason for you to attempt to handle removing the snake on your own. A rattlesnake bite can be deadly, and contrary to what the movies have you believing, not all bites are preceded by a rattling sound and a coiled position. When you hear about people getting bitten by venomous snakes, it is usually because they are trying to handle or kill the animal. You should do neither. Wait for a professional to arrive. If you are lucky enough to have a glue trap for snakes, you can try to close the trap into the room as long as it does not put you at risk. This will most likely be futile as the snake will be intent on getting outside and will not easily fall for the scent lures in the trap. Age of diamond back rattlesnake - There is no way to definitively tell the age of a rattlesnake, though you can make an educated guess by the number of segments on the animal�s rattle. Each time a snake sheds, which, for the rattlesnake is usually annually, a new segment is added on to the rattle. The reason you cannot go by this as a fail-proof method of aging a snake is because the rattles are prone to breakage. If you see a snake with four segments on the rattle, that manes the snake is at least four years old but could be seven, eight, or twenty years old. An expert will be able to tell by examining the snake what a narrower age range might be. The condition of the teeth, the size and weight of the body, and the condition of the animal�s eyesight are all things that can indicate age. By adding all these variables together, a reasonable assessment can be made. 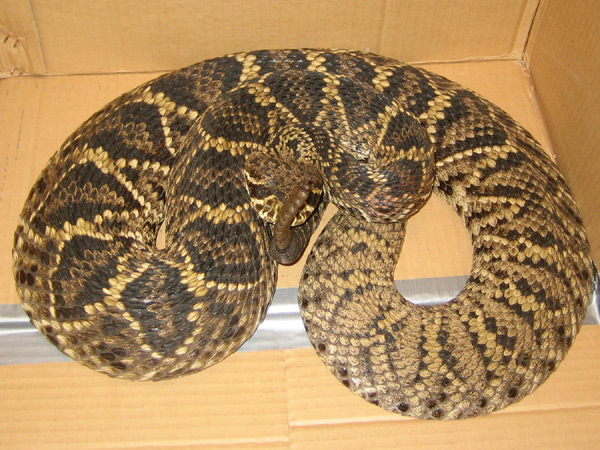 Rattlesnakes can live to be twenty years old, though there is a high mortality rate due to predation for young snakes.